This map from the National Weather Service shows a storm system moving from west to east across Louisiana. A tornado watch remains in effect until 7 p.m. Saturday for north-central and northwestern Louisiana, the weather service said. The coming weather prompted the Walker Police Association to cancel the second day of its inaugural rodeo at the Livingston Parish Fairgrounds. “Due to the weather and safety reasons the rodeo for tonight will be canceled,” the police union announced. Showers and thunderstorms are expected this afternoon in Livingston Parish, the NWS said, with southeast winds 10 to 20 mph increasing to 20 to 25 mph. “Chance of precipitation near 100 percent,” the weather service said. Local law enforcement agencies have been issuing safety alerts. “With the possibility of severe weather in the area this evening, we’d like to remind everyone to be aware, take extra precautions, and avoid being on the roads unless absolutely necessary,” said a social media post by the Denham Springs Police Department. Drivers who might go out in bad weather in Denham Springs also face closed railroad track crossings. The Hummel Street and Range Avenue railroad crossings are expected to be closed until 7 p.m. for repair work, police said. Alternate routes are Hatchell Lane or River Road. 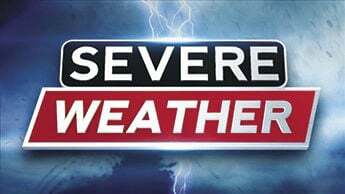 The National Weather Service issued a severe thunderstorm warning at 1 p.m. for northeast Louisiana, from 14 miles west of Jonesboro to 16 miles west of Winnfield, affecting six parishes. The weather system is moving northeast at 45 mph. It contains 60-mph wind gusts and quarter-size hail. In Livingston Parish, the NWS said, Sunday should be partly cloudy and cooler with highs in the upper 60s and 20 percent chance of light rain in the morning, according to the NWS. Westerly winds should be at 10 to 20 mph. By Sunday night, the lows will be in the mid-40s with northwesterly winds from 5 to 15 mph.